A hockey stick used by Stratford’s Charley Lightfoot near the turn of the last century will soon be part of an exhibit at the Hockey Hall of Fame. Lightfoot was one of the first black players in organized hockey. 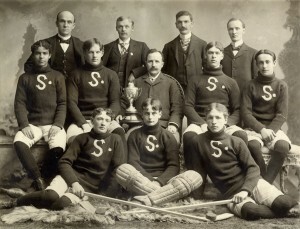 The Ontario Hockey Assocation was was founded in 1890. Lightfoot, the ancestor of a Kentucky slave, played on the Stratford team that won the OHA Junior championship in 1900 and on the Intermediate team that won the OHA championship in 1901. The timing of this donation is excellent as the Hockey Hall of Fame will unveil a thematic exhibition titled “The Changing Face of Hockey – Diversity in Our Game” on March 11, 2016. Lightfoot’s stick will be showcased as a part of the exhibit. Lightfoot was born in West Flamborough in 1880. His family moved to Stratford in 1888 when Charley was 8. He died in 1968. 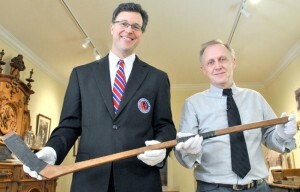 Two sticks used by Lightfoot were donated to the Stratford Perth Museum in 1975 by former Beacon Herald sportswriter Harold “Winger” Thomas. One of those sticks will be given to Craig Campbell from the Hockey Hall of Fame on Wednesday at 11 a.m. during a brief ceremony at the Stratford Perth Museum.